“You are right.” He says. I look up into the shy smile I have grown to love so much. Day 178 of bandaging this wound, and it is almost gone. I focus my gaze back on the bandage to hide the happy tears. I am right, but sometimes, I need reminding. Sometime in April, Christine pulled up in my van. “I have a patient for you,” she said as she opened the back door. I knew he was in bad shape as he tumbled out, and I could feel the vomit surge hot in my throat as I caught that first glimpse of his leg – skin burnt charcoal black, bone exposed, nothing even still alive enough to bleed. I knew this man. At least, I thought I did. As the village drunk of Masese, he was a constant annoyance to me. I was appalled but not surprised to learn that while he was passed out in the middle of the day, some neighbors lit his house on fire. The fire caught his leg and he crawled out just in time to watch his neighbors steal all his remaining belongings from inside. And thus began the season that I though would heal him, but instead healed me. He moaned as I injected painkiller and mumbled a story that I couldn’t understand. I prayed over his wound and over his heart, and when he fell asleep on the porch, I didn’t make him move but draped a blanket over him instead and I didn’t realize that just this simple action would be the beginning of coming to love the newest member of our family. The doctor at the best hospital around told me he would lose his leg if I didn’t dress and clean it daily. That probably he would lose it anyway. At this point, I don’t think he cared one way or another, but I did. Just months earlier, tragedy had struck our family. And although I had no idea at the time, Jesus was bringing about my own healing by drawing me into someone else’s. I couldn’t verbalize it then, but it is as if my heart screamed, “I lost my daughter. I lost my reality. You will not lose your leg. You will not lose yours.” And so I threw myself into becoming an expert on third degree burn care. For hours each day I scraped the dead skin from this wound and God scraped at the dead places of my heart. Buried places that, though I would never say it, somehow doubted that God could be good, all the time, when my daughter’s bed lay empty. And I said it out loud, to him and to myself. God uses all for good. For His glory. God is using this, I said, and I smiled at new pink life showing through and though I didn’t recognize it yet, God was growing new life out of the very hardest places of my heart. For a month he came and went. I would bandage the leg and send him home; he would return the next day and I would almost be thankful that he was drunk because even still the pain was excruciating. I would wash and scrape and scrub and dress and I cry and I would say to that wound and to anyone who would listen, “We will not lose this leg.” Others from the community stepped over our new friend asleep on the porch and they shook their heads. “You can’t save ‘em all. Not this one, Katie.” But I am stubborn. And God is relentless. Eventually he just moved in to the little house in our back yard. This made finding him at bandaging time quite a bit easier and it allowed me to make sure he wasn’t drinking. As he began to sober up, we began to have longer conversations; he would tell me all about his life and his family before he became an alcoholic and found himself homeless in Masese and I would tell him about a Savior born as an infant in a feeding trough and nailed to a tree. He questioned everything I said about God’s goodness and sovereignty, and I know that as I was answering him, I was answering myself, too. In the darkest place of my life God had me testify each day exactly who I knew Him to be. In those hours of wound bandaging He was introducing Himself to me again. The Working All For Good God. The Still and Always Faithful God. The God who sees who we are and uses all the broken places to make us who we are becoming. I said these things out loud and I watched God make them true all over again. And this is what I learned: the hard does not minimize His goodness but allows us to experience His goodness in a whole new way. 252 days of wrapping and talking and laughing and crying later, new skin covered this once dead area. The leg that so many thought was lost could walk and even run. And the man that so many thought was hopeless had been sober for over 6 months. A week later, this physically healed man walked into my kitchen as grinned from ear to ear. “I believe it,” he announced, “today I believe that Jesus is the Son of God.” Simple as that. I didn’t try to contain my excitement as I danced around the kitchen that day, and I still daily choke back tears as the time I once spent wrapping his leg in gauze is now spent scouring the Bible together for the answer to his every question. The burnt area on his leg is still a few shades lighter than the skin surrounding it. “Can I look at your leg?” I ask often, and he knows why. “See what God did?” he will chuckle. And we both see so much more than new skin. Jesus. He met us right where we were, right there on the cold hard tile of my sun room, and He took two broken people, so different and yet so much more alike and showed us the scars on His hands and said its ok if we have some too because the scars are always drawing us to Him. I know you don't like to be called amazing, but it is AMAZING how you allow the Almighty Father use you in such Awesome ways. Our family prays for you and many other missionaries and the precious people you all minister to each day. God bless. Thank you for all you do in and through Christ. Powerful. Brings tears to my eyes. Shows me who God is all over again. What a wonderful post Katie. Oh,I don't know if I could ever clean such a wound daily. But I'm very glad you did,and I'm sure Jesus is as well. Thanks for sharing so humbly, so vulnerably and so beautifully. oh my katie...such beauty in a redemption story. Oh Katie...I am just crying...again...and Praising our Great God! I pray I will be able to see you this summer while I am in Uganda for the month of July! Just wow. How He heals through us broken. Oh, sweet friend you sparkle His light. Thank you for loving. It reaches across the ocean and inspires. amazing grace. Thank you so for sharing. The burning sting of tears fill my eyes, but oh, how joy and rejoicing overflows my heart. What an amazing God we serve!!!! Choking back the tears...sometimes we all need the reminder of His goodness. Thank you for sharing. I really needed to hear this today! I pray God blesses your family! Oh, wow! I so needed to hear this today! I read your post through tears! Thank you, Katie! Beautiful, Katie - absolutely beautiful!! We rejoice with you that we now have a new "brother"! God is SO good...ALL the time! Thanks for sharing your story as well as your heart. Absolutely breathtaking and beautiful Katie. I heard this story in your interview with David Platt (I watched it on You Tube). Such a gift to hear his wound is nearly healed completely. Praise God!! Thank you for the update -- we think of you and pray for you and the people of Uganda often!! Katie, God is so kind to meet us and be relentless. Thankful and encouraged by this post. The Lord make his face shine upon you today. The love of the Lord shines through all you do, Katie. Thank you for your hard work, day in, day out! May your service in His name be continually blessed! Thank you, thank you, thank you! Our God is an awesome God!! I bought your book and am excited to read it. Your passion for the Lord is absolutely beautiful and He is using you like crazy in Uganda, and here in the US. You have helped me realize what a servant's heart looks like, and what a woman of God looks like. And what a humble heart is yours, sweet Katie. God bless you and your children and ministry! I am asupporter-financially and prayerfully.. Maybe the Lord will allow me to meet you one day. 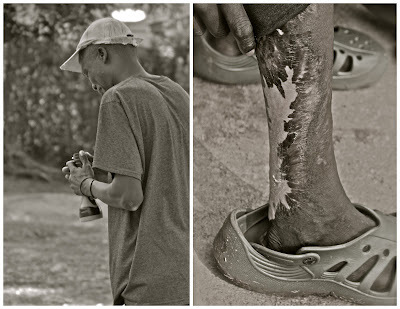 PRAISE HIM for healing Makerere's leg and his HEART! I am rejoicing right along with you and the angels in Heaven!!!!!!!!!!!!!!!!!!!!! One more added to the Kingdom of Glory. Beautiful story, Katie! Thank you for sharing and your faithfulness to the Kingdom of God. I know that it says I'm Lori Florida but this is her daughter - Chloe Florida. I'm 11 years old and I live in Michigan. I just wanted to say thank you. My family is adopting from Ethiopia, and my mom has been reading adoption books. A friend from Church told her about Kisses From Katie, and now she's reading it to our family of 8. One night when she was reading it to us, I don't really know what happend but now I know exactly what I want to do when I grow up. I want to be like you, I want to move to Ethiopia and adopt a whole lotta kids. I want to be a Katie Davis when I grow up. it talked about how love can make you do crazy things. In part of the song it talks about how you moved to Uganda adopted 14 girls and how you used to drive a BMW(: Then it said that if somebody told you what you were doing was crazy, that you would of said "that's what love makes you do." You really inspired me and I just wanted to say thank you. I love what you're doing. P.S. I really would like to email you but i don't know your address. Amen, hallelujah. Praise God for your resolve and willingness to help him not lose his leg (or his soul). God bless you Katie. You're doing an amazing work and I am in awe of the gift that God has given through you. Grateful for how connected God has made us-Him, us, them. Thank you for sharing this dear sister! Beautiful! I love every piece of this story and how it glorifies our Lord! Isn't it crazy.....what God uses....how HE works.....and we are soo amazed because we see HIS miracles firsthand. LOVE IT! Thank you for sharing your heart. amazing. thanks Katie for the reminder of how to be the hands and feet of Jesus. You are an inspiration to so many. May Jesus fill your tank full to overflowing today. Katie, I'm not a very emotional person, but when I read your posts -your honesty- I tear up a little bit. Thank you for your encouragement and love for the Lord! Beautifully written and so utterly uplifting. Thank you for vividly reminding me of His good, healing work. It's amazing what God can do. Heals lives, Mends bodies, touches hearts and saves souls. Praise be to Yah for all he does every day. He does for us even when we don't know he is doing anything. We may not recognize at the time his love for us, bet eventually we do and say Ah, that is why he did what he did. Bless you. Praying for you and your family. Sending you hugs! Luv you. Beautiful Katie! I haven't posted a comment in so long, but I wanted to tell you that after I finished reading your book I had my husband read it. And now, he is reading it at night to two of our children (7 and 9). It is opening their eyes and changing their hearts (well, God is doing it THROUGH your book :) And each night when they are finished they pray for Katie...we all do. Wow, that was beautiful! Praying that God's healing continues in both of your hearts! Blessings, Katie! Katie, your blog posts amaze us...we are ten Christian women in a book club in Florida, reading your book and enjoying your blog. We are wives and moms and we want to talk about supporting you. THANK YOU for teaching us that falling into bed at night exhausted for Jesus is the life we want ! I needed to hear this today. To be reminded. Thank you for being open and honest. Much grace and blessings to you in the name of Jesus. I can relate to what you are saying about God even using the bad things for our good even when we cannot see how any good could out of a situation. Last fall a young man from our church died and I thought to myself How could a God so great Take someone so young? How could anything good come from this terrible thing? Well, long story short the young man's dad accepted Christ through his death and now they will get to see each other in heaven. God brought a father's life from his son's death. This Friday another friend from church died in a car accident. It is so hard to understand how he could this all happen. These past couple days i have found myself asking those same questions and i really wanted to thank you for reminding me That God uses all things for his good and perfect plan. I can't wait to see how he uses sweet Anne's death. Thank you for taking time to post this, your blog and your book are an amazing source of inspiration. You and your family are in my prayers. Your life/story amazes me more with every thing I read! I wrote a blog post about your book after reading and and noted that I pray each day that my children will have a "Katie attitude." Thanks for telling your story....you're changing more lives than you know! Again Katie, I am brought to tears reading this. Although our journies are different, yours the life of a missionary and mine the life of an infertile wife I realize how similar all of humanity is. I am in need of some healing on this journey with infertility. Thanks for reminding me He'll use this for good, somehow, somewhere. I have no words.......God is so good and has such perfect plans and He is definitely showing off in you. Blessings abundant to you in your ministry. Our God is an AWESOME God!!!!!! Thanks for sharing. Katie, I am a follower of your blog and am encouraged each time I read your posts. Thank you for sharing and for being so transparent. Today's post is one that spoke to this broken heart of mine. All I can say is "thank you". Meanwhile, please rest in knowing that this North Carolina girl is praying for you and thankful for your obedience to serve the Lord. Katie, Your heart for the hurting humbles and amazes me and what you are teaching me, a 63 yr old grandmother about loving others is beyond measure. Love your book, love your stories, love your passion for the people of Uganda. I know God will continue to bless you and yours. SO encouraged by every post. Just finished your book, and blogged about you too. SOOO INSPRING! I know you would say it is nothing. But to many it is soo much! Love it :) God is awesome!!! Beautiful, Katie. Thank you, thank you, thank you for the amazing gift of your friendship- you bring me closer to God. Thank you, Katie. I really enjoy your stories and you taking the time to write them out. God is so powerful and amazing! That is one of the best story's I have ever heard! I am so happy for him, andd for you for sharing the gospel. Katie, beautiful story. What a God we serve! I love hearing how God is working in your life. You are amazing. May he continue to use you and your family for His glory! blessings from a young sister in Christ! What a beautiful picture of what Jesus does to our cold, dead hearts so very sin sick. Thank you for loving this soul to Jesus. Oh how God speaks to us if we would just listen!! Your eloquence is matched by the Spirit I felt as I read this today. I needed this message today, so much. I wish I could reach out and hug you, to thank you for your example of unwavering faith. What exquisite Joy is brought by the One who heals! All Glory to God! All I can manage to say right now is, WOW! You, beautiful Katie, are one amazing woman of God...and I thank you for teaching me so much about how to love even in the midst of hurt and how to believe even when I cannot see! I love your heart; i love your passionate and intimate love for Jesus, and I love you being His hands and feet...Jesus with skin on. I love you and I cannot wait to see you when I come in June to lead a HEAL Ministries team! Praise be to God, the Father of our Lord Jesus Christ! AMEN! Your stories never, ever cease to amaze me. God is good ... all the time. As I walked through the most difficult crisis of my life (a year ago), God had me ministering to others that were walking the same journey. He regularly had me sharing with and praying for others ... sharing His goodness ... so that I could see Him in the darkness of my life, as well. speaks to my heart in so many ways. Thank you. Katie Davis, you have no idea how your life and testimony is weaving into mine, but I am so thankful for you and for what you are allowing God to do through you. Oh, Katie, I look at your blog daily, with great glee, waiting for an update. Thank you for sharing your life, your heart, and your joy and sorrows with us. I've been reading your blog for a while, and it's such an encouragement to see you chasing after God and showing His love in your life, even when it's hard and hurts. I'm always so touched by what you write. As someone who's getting ready to commit my life to missions, I'm so glad to hear that you've grown so much in your relationship with Christ with every single encounter you have. I've been praying for you, and will continue to do so! Have a fantastic day. Praise be to God. He heals all wounds, if we just let him. The healing of a third degree wound and a broken heart is anatomically different, yet the same. I continue to pray for you and your wonderful family. May God continue to bless you and yours daily. I thank God for you. You are a blessing to me. Thank you for sharing. Our God is great, isnt he? Beautiful. I had chills the entire time I was reading. To God be the glory! God is awesome. Glad you found time to blog, love hearing how God is using you! Praying for your ministry. Katie thank you for sharing this story. I needed the reminder today that God is good all the time and that He is the healer. I know that you are busy and I am glad that you took the time to write down what great Thing He hath done. Praying for you, your family, and your work. Katie- your willing heart and your honesty is so encouraging. God does meet us right where we are, all the time, every time. He is a relentless pursuer of souls, even the ones He already holds. When we brought our children home from Ethiopia, it was so difficult to see God In the hardness of it all. But like you and so many others, He uses that hard time to draw us to the feet of our beautiful Savior and remind us all over again of His great love for us and of the truths we seem to so easily forget. God is getting the glory in your life Katie! Keep perservering and drawing your strength from the One who says "nothing is impossible with Me!" Your life, your ministry, your mission is such a sweet testimony of what God can do through a willing heart. May He get all the honor and glory and praise! You are an amazing inspiration Katie. Your SOLD OUT for life to Jesus outlook tears me up and I believe that when is hurts, God is working. God be with and bless you and your girls. oh Katie, I find it simply amazing how God will gently yet very profoundly pull us out of our own pit of doubt's that we put ourselves in. I'm also amazed how he can use the pain of another to heal us from the inside out. Thank you so much for this testimony today. May God use your pit dwellings sweet sister more and more every day to heal the soul of another. In Jesus name, amen. Wow. I am so blessed. I consider this as Jesus talking to me as I also need healing over my loss. It's as if He is reminding me that instead of coddling my own pains, I should become a blessing to another who has not known Him yet. God is so good thank you for sharing this life changing story. He is our healer. Thank you Katie. I needed that post today. God bless you! A good reminder of Gods unfailing love and why we should never assume that someone or something is a lost cause. God never gives up on us does he? This is so amazing what God has done. In your life Katie, and in others around you. You don't know me, but I have stopped by several times to read your story. As an adult MK from West Africa, your photos and stories remind me a bit of home. I have started reading your book too, and love seeing Jesus in you. I missed some posts and didn't know you had lost one of your daughters. I am so sorry. Thank you for your honest God-honoring post here. I rejoice with you over this man's life being transformed, and a brother to meet in heaven, and I teared up at times as I read your honesty about the old skin becoming new in your heart over the hard questions too. God woos and tenderly corrects me through your words this morning, and I whisper back to him with tears. I see Jesus in you. Your writing has really grown over the years too. I am proud of you. Today's post has a slight Ann Voskamp flavor, whom I enjoy and appreciate as well. Thanks, my sister in Christ. I pray I will never know the pain of losing a child. But I do know the pain of losing a love. You're never the same, but it does get easier. Your relationship with G-d will be different too, as you're seeing, but that doesn't have to be a downward step in the relationship forever, as you're also seeing. Praying for you and sending lots of love your way. Loved reading your last few blogs. They spoke so deeply to my heart. I love how God makes beauty out of ashes! I'm going through a trying time right now. There is a battle raging in my heart, but I know that God does work all things together for His good. Thank you for reminding me of this! Wow. That is all I can think as tears roll down my cheeks. Thank you for sharing this with us. It will give me much food for thought. Katie, thank you so much for sharing your thoughts and experiences. Your words have touched my heart today. Thanks so much for reminding me about how God heals me and the people that I try to help. Almost daily, I have an opportunity to assist families that have been devasted by fire. Yesterday, I talked to five Nigerian families, all of them experiencing the doubt and frustration that comes from all of a sudden loosing your home and not knowing what to do as a provider. None of these families suffered the physical pain that your friend did, but they did experience the sense of being lost and frustrated. As I helped them take the initial recovery steps by assisting with food, clothing and lodging, I was reminded that my efforts are nothing compared to what God can do and does do. My efforts are so finite while His are so infinite. Praise God and thanks for bringing glory to His name through your ministry at Masese. My heart and prayers go out to you and the people of Masese. I need to stop reading your post before I have to go somewhere-I always end up in tears! I love hearing about what God is doing in your life and in the lives of the people in Uganda! Thanks for sharing with us! What a testimony Katie! Praying for you as you do His work! Beautiful! Thank you. God is good. Beautiful words! Thank you for sharing what God has shown (and is showing) you. It's a lesson for all of us! Thank you for sharing it with all of us and never failing to give God the glory! Ashes for beauty. The bad for our good. A sinner turned into a saint. My dirty rags of good work... He uses it all. All for His glory. Amazing God! Thank you for laying down your life Katie, to bring life to others. Thank you Jesus for laying down your life to save and bring life to us. A TRUE LOVE Story about our TRUE VALENTINE; Jesus Christ! Thank You for your love & obedience, Katie! This is such a beautiful story of redemption. May I always remember that God is good - even in the hard! Thank you for this glimpse of God's glory! I always get so excited when I see you have a new post because you always speak right to my heart. Thank you for being truthful and sharing your experience with us so that we may be encouraged together in what God is doing. It's amazing how we get to share in the blessings of the Gospel when we see others being brought to Christ. Thankyou for sharing! 1 Cor 9:23 "I do all this for the sake of the gospel, that I may share in its blessings." This is what it's all about. What a world changer you are. I want that same healing you got. Losing your kids to a biological parent hurts. Fighting in court for their safety and having to contend to a biological mother is impossible. I want to be on the other side of the pain. I want to see beauty in my suffering. I want to know that God will use this pain to bless others. Amazing!! I love to hear about how you are helping so many people! How long have you been in Uganda? How old were you when you went there for the first time? Praise the Lord! Brought tears to my eyes. Someone said that in America, some of us have the sin of apathy. That is very true. You are giving your life to others by caring for them. That's what God wants us to do. Live for God and share His love with others by caring for them. Remember the two greatest commandments Jesus gave. Love God with all your heart,soul,mind, and strength and love your neighbors as yourself. I hope this will encourage you to continue what God has amazingly given you. Katie, I stand amazed at your sweet surrender! The Lord bless and keep you and use you to be His hands and feet. Much love and thanks! Your posts are life changing. I love that you bring the truly broken into your home. I live oversees myself, and your story has reminded me that I'm not alone, there are 7000 others. God bless you. You remind me so of Amy Carmichael, my spiritual Amma. She wrote a short poem, "Hast thou no scar?" No hidden scar on foot, or side, or hand? by ravening beasts that compassed Me, I swooned. And pierced are the feet that follow Me. Who has nor wound nor scar? Yes, Katie, you know exactly what that means to the praise and glory of our Mighty God who has been so gracious to you to learn these things at such a young age. Your feet are not whole (as ref in the last stanza) I pray for you and God's ministry through you there. Tears here...Praising Our Great Physician for His faithfulness to reach down and touch even the hardest of hearts. "the hard does not minimize His goodness but allows us to experience His goodness in a whole new way." Are you sure you haven't been to seminary? Katie, not only are you an inspiration to anyone trying to figure out what living in God's will looks like, assuming you're not being edited, you're an extremely talented writer. Keep being a light to your generation! WOW...thank you so much for sharing this..we serve such and amazing BIG God..
You are also an incredible writer and so young!!! Goodness...love your heart so much. I live near your home I suppose...my backyard is in Tn. near Clarksville and front yard is in Ky! I am so encouraged by this. You have inspired me to go to Africa to serve after high school is finished. I want to be a part of God's Kingdom on Earth just like what you're doing. God bless! "Unto the least of these..." is what you are doing. Daily. You care about His glory & it's evident that He is molding you into His image. The Refiner's Fire is Doing a beautiful work in you. I am grateful for the testimony that you have. Beautiful. Inspiring. Moving. Powerful. This message, this story is filled with love, grace, and growth. I am holding back my tears. Thank you for inviting me into your ministry. This work is important to the kingdom. It brings hope and healing to many. This is the work that I dream of doing some day soon:D Thank you for showing me that this is possible. I thank God for your life. So thank for our HEALER God! So thankful for you and your beautiful heart, always pointing to Him. A wonderful story, and beautifully told! My wife is reading your book, and I'll read it next. Glad you followed the Lord down this path! Katie thank-you for everything you do! I have read you're book and it is very powerful and inspiring! Reading about you're experiences makes me feel lead by the Lord to become a missionary more and more! I somehow stumbled upon your blog one day and eventually bought the book. I have finished it effortlessly and I find myself inspired. I am a mother of 3 with 1 on the way. My husband and I started a ministry in michigan that we are taking to Kenya, Uganda, and Sudan and have been planning for 3 months. We have a special needs daughter that was supposed to pass away at birth and is now 2. Praise god. We have received persecution for wanting to move our young family to Africa with a child that we are uncertain how long she will live....but we hear gods call.....and I find myself reading your blog regularly. I pray that we can be used as you are Katie. I praise god for your humble spirit to listen to him and I pray I can be as you are to others. I shed tears almost every time I read your stories and I dream of the day my family will wake up in the place he has called us. Thank you for your genuine display of Christ. I have been refreshed. Blessings to gods ministry.....amazima Maybe we shall cross paths one day in ministry. Praying you will be blessed today. I just finished your book! I am so thankful that you are allowing God to use you. My husband and I are praying for God's perfect will for our lives. He is a pastor of a small church here in Alabama, but we have recently realized that God is calling us to do more. Please pray for us. Everywhere we turn it seems like God is calling us to do some form of foreign mission work. We are praying as to whether this will be just short mission trips or a permanent move. My brother just returned from a pastors conference in Uganda and he and some other pastors took some shoes to an orphange there and visited a refugee camp. I havent got to speak with him yet but his stories always break my heart but also make my heart rejoice to see God working. We have been praying earnestly and all things are pointing to a trip to Africa. Your book helped to confirm this. Im not sure how soon we will be visiting africa or to what part God will be taking us and like I said before if it will be permanent, but please be in prayer for us. We have told God yes and are now awaiting to be told where to go. All glory and honor to Him. Katie, I love your blog I think you are doing something that is so great!! God is working in you in so many ways! NEVER give up hope even when it gets hard just keep going and God will help you get through it. I just finished reading your book, I absolutely loved it! It is so inspiring to see your love for Jesus. You are an incredible young woman!! God Bless you in all that you do!! Just finished your book and absolutely loved it. I recently found out that I am leading a trip to zimbabwe this summer to work in different orphanages and schools. Your book has inspired me so much to love fiercly everyone in front of me!! I appreciate it!! God's richest blessings on you!! And so much love from Napa, California! Wow. Your writing is so inspiring and full of authenticity. I feel I am there with you...seeing his leg, feeling your struggle. i needed this today. thanks for your encouragement in your faithful blogging. it's such a good thing to remind ourselves who God is. He never changes. we just forget He is who He says He is...always. praying for you, your ministry, and your children (both adopted and spiritual children). God Bless you Katie...and hold you and keep you strong...and all those lovely children of yours. You bring hope, and faith, and love...you bring Him to the world. Thank you. How beautiful I can imagine and see this in my minds eye. Amazing Grace. Your story encourages me so much. I just wanted to let you know. I LOVE every time you post. Thank you for continuing to get me out of my comfortable middle class thoughts. Thanks for the graphic details that for the first time in my life showed me I could make a difference in real peoples lives and pain. So excited to partner with Amazima. Give Faizo B. a hug for us! This is such a beautiful picture of redemption: spiritually, physically and emotionally. God is so good. You have the gift of allowing others to experience the Lord through your writing. God is amazing! what your doing is awesome! and gives me hope, i went to Uganda two years ago and it changed my heart, i gave my life to god there on the Ugandan red soil and left my heart there. i can't wait for the day that i got to go back permanently. what your doing is amazing and god has huge plans for you! keep it up! maybe one day i will run into you when I'm back over there doing my ministry! 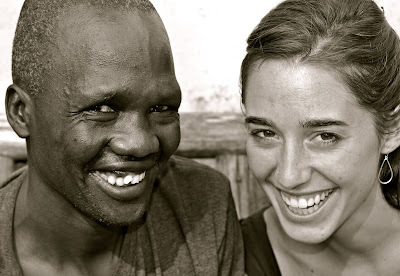 Katie and Makerere, Like so many others, the tears fell as I read your post! Especially, Makarere, when I saw the picture of your leg and the new skin...I remember sitting on the porch with Katie one day and helping her to clean your wound. I had had decades of experience with burns. I cleaned a lot of tissue from around the tendon, and prayed that somehow, new skin would grow where there appeared to be no skin left. To see the skin that has grown back is to bear witness to the healing miracle that God has worked in your body. To see your smiles in the pictures, both or you, is to bear witness to God's healing miracles in both of your hearts! Katie, may God continue to bless you, as you bless all of us with your work. And Makarere, may God continue to bless you and may His light shine ever brighter in you each day! The brokenhearted binding up the broken. Jesus healing it all because He knew. Thank you Lord! 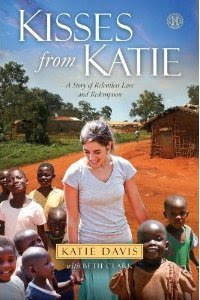 Very much enjoying your blog, Katie, and reading your book -- and receiving inspiration from them both to live closer to God's path, in His Service. Thank you for taking the time to share. I was intrigued to read in your book of the immense poularity of Celine Dion in Uganda and too amongst your childred. Celine was born into a relatively poor family in Quebec, Canada, and had 13 siblings. A similar sized family, n'est pas? God Bless. Praise be to God. Wow. Just wow. Bless your heart, Katie Davis, just bless your heart of obedience and love. That is absolutely beautiful! My mom bought me your book for Christmas and I read it, learning more and more about how wonderful God is. My mom and I suggest the book and share it with any and everyone at church and at home. I was having a tough time when I read it and it opened my heart and made me want to read my Bible and pray harder. I've been praying hard for opportunities to share my faith and they've been popping up in the least expected places. So I pray that I'll know what to say because I can't let those precious friends go. I have to at least try to show them to Jesus. I love your story and I kind of want to go on a missions trip now. Thank for all you do to help those poor people in Uganda and all the spiritually poor people here in America! You inspire me so much, ever since I read your book a few months ago, I cannot seem to get you,how wonderful God is, and Uganda out of my head! Also, I just learned about Kony today, and the 30,000 Ugandan children he has taken, and how awful and heartbreaking it is. katie, thank you for loving this man. for seeing him through Christ's eyes. for helping us to see him, and for helping us to believe, all over again. praying for you, sister. e.
You make me wish that I was 21 all over again (and in all my adult years, I've never wanted to 'go back'). I have been in f/t missions for 13 yrs, starting when I was 40. May the Lord grant you grace and courage to continue moving forward in what He has in store for you. Thank you for being courageous enough to not store up your treasures here on earth, but instead to invest in these little lives who will grow up knowing the love of a mother AND a Father intimately. "If you do it unto the least of these..." You are an inspiration. God be with you! Thank you so much for sharing your sweet spirit. I loved your book and I love your blog! I thank my heavenly father every day for reminders of his love like you. Thank you for all of the work you do in his name. My prayers go out to you and your beautiful family. Thank you for your example and inspiration! I'm writing in the hopes that you might be able to write back :) We're the same age. In short, I accepted Christ three years ago and through many stages I know beyond a shadow of a doubt that God wants me in Africa. Just yesterday I wad trying to find the words to describe what has been in my heart. Today I started listening to your book and my heart was relieved in a sense to hear you voice my feelings. I will be going to spend time in Tanzania and Kenya starting in January of next year. I'm hoping I might be able to make detour to visit you in Uganda. Thank you for your testimony. It has encouraged me greatly... I cannot wait to follow God's leading. I'm ready to go this minute and it's so hard to have to wait 9 months before I finally get to get on a plane. I love your blog!! Keep posting! "And this is what I learned: the hard does not minimize His goodness but allows us to experience His goodness in a whole new way." I have been through a hard year and this line ministered to my weary soul. Thank you kindred heart for letting the deep stirrings of your heart cause you to die to yourself daily, being the hands and feet to people. I resonate deeply with your heart and am so challenged and refreshed by your authenticity, rawness, and genuine faith truly living out the pages of scripture. The Lord has been stirring and messing with me and your heart and book have been another instrument of His in carving new dreams and purposes; His dreams and purposes for me. Wrecking me. This song has been speaking that greatly and wanted to share with you, for His kingdom together! Wow! God is sooo good! Some of my friends are in Uganda right now on a mission trip. I'm going to visit some Christian friends in Benin, West Africa this summer. Please keep us in your prayers! God Bless! I can hardly read your post without tearing up! Africa is very dear to my heart because I used to live in Benin and mission work has always been a huge part of my family's life. It's very encouraging to hear about all God is doing through you!! God bless!! Katie, I can't tell you how much of an inspiration God's life in you is to me! You see, it has given me hope and caused my faith to grow, to see through your life what God can, and does do everyday. Your humility, brokenness and transparency–your willingness to let the world see the scars and yet even more clearly the Healer–is an incredible testimony of God's grace and sufficiency! I've spent much of my spare time in the past week or two (ever since first hearing of you from a review of your book on Young Ladies Christian Fellowship's website) reading your blog, at first starting with the more recent posts, and then deciding to start at the beginning and go to the end. I've just finished. The stories are captivating–and the pictures speak even louder to me, a very visually inclined person. It has made me think. A LOT. It has led me to do some research and gather information on various things like aids, and adoption. It has made me remember to be grateful for the cloudy days as well as the clear. It has led me to share with my friends and family about things I've only recently learned. It has strengthened my desire–my longing–for missions. It has changed my heart–and life–in so many ways! I wish that you could only see how much! May our Lord continue to bless you and your family! You will be in my thoughts, and prayers–I will never forget you! I love that you are allowing God to use you in a mighty and powerful way. Praise be to God!! Prayers of blessings to you and your family. Beautiful writing and what a beautiful mission you have. Thank you for being His hands and feet. I came across your blog. Your blog is truly inspiring. You are truly inspiring and amazing. May God continue to bless you. God Bless. Thank you Katie. I do not know you, and yet we are sisters in Christ and God uses us to lift one another up and to encourage one another :). How amazing is our God :)! This such a beautiful story and so beautifully told. I'm going to share it with my readers. I predict it will inspire some of them to live a life that looks like the life you're living. Thanks for following Jesus to that place, Katie. Hey Katie. You have so many comments to read; I can't imagine. I know it must be so encouraging. I'm not sure what to write... usually once I start writing, a novel is produced, but I'm trying to be sensitive to the fact that you have 1,000,000 fans and an incredibly busy life! :) In a nutshell, I'm a Kindergarten teacher in Suriname, South America (little country above Brazil) and have been for 2 years now (I'm from Memphis). I graduated college telling God I would follow Him wherever He led me, and it just happened to be to this little Dutch country. It's good. It's home now. There's just this part of me inside that feels there's more... something maybe I'm missing, or perhaps just something God is stirring within me for a time to come. I don't know. Anyway, in saying that, I'm drawn to your book and your blog. I read your book through once and, when I have time, I am slowly going through it again, intentionally noting the parts that touch my heart the most. A friend of mine said she hears and sees me when she reads your words, but I don't know; I haven't embraced courage through Him like you seem to have. All I know is that your words speak to me and I cry these tears that just make me want to get up and praise Him and move mountains in His name and.... oh, I don't know. I'm already rambling. Basically, thank you. for everything, but mainly for being real. for taking the first step. and the second. And, I can imagine with your fan base that I will not be the first to ask this, but do you need any help in what you are doing? Ha, I just realized how that sounded- OF COURSE you need help! :) Don't we all? What I mean is.. do you need someone to come there and live and work alongside you and your ministry there? I am totally just putting it out there in question.. you might get 50 offers a day by people emotionally moved by your words and desperately wanting to help out in some way. I don't know, but I just feel the need to at least inquire. I am jealous of your opportunities to serve, BUT I know that I have my own, wherever I am. They don't all look the same; it's just that yours touch a deep place in my heart. Wow, I just realized I wrote a long paragraph (i'm bad about spacing it out, sorry). Thank you for sharing this particular story. I've wanted to write you for many months now, but didn't want to do it flippantly. I wanted God to keep speaking before I did. I chose this story of all to write on because I think it spoke to me the most. I printed it out several months ago and shared with my teenagers at youth group one night. I showed your pictures from it as well. They were attentive and asked many questions, most I couldn't answer. The point is, they were listening. So anyway, I better go before this gets longer. If nothing else comes from this comment, at least I know I shared my heart to a soldier in Christ that Jesus has spoken through to me numerous times. Go strong in Him, sista! Katie, thank you so much for your blog! You are an inspiration to many! YOU are a blessing to these incredible PEOPLE just as they are a blessing to you! It is so refreshing to read of the depth of love and care that you have for these incredible people. You are doing what so many of us would love to do but don't even know where to begin. Anyway, I look forward to catching up on ALL your blogs as I just discovered your blog only a few days ago. You inspire me! I can hardly WAIT to read "Kisses from Katie!" Katie, Thank you SO much for your blog! What an inspiration you are to SO many in this world! YOU are an INCREDIBLE blessing to these PEOPLE as THEY are an INCREDIBLE blessing to YOU! Please continue to write as I will continue to read. I just discovered your blog only a few days ago and am hooked. I can hardly WAIT to read "Kisses from Katie!" This is one of the most beautiful blog posts I have ever read. I tried to repost the link to facebook so my friends could read it, and facebook says it has blocked the link due to content and spam. I have tried multiple times and in multiple formats, but each time it is blocked. I wanted to private message you, but was unable to on twitter. Hopefully your content moderators will be able to go on the site and see what the problem is. I certainly hope and pray that it is not a ploy to block the Good News of Jesus Christ that you share with love and joy on a daily basis. Beautiful! Thank you for sharing.